XP11 is the power supply for the Concept 2000XP system. 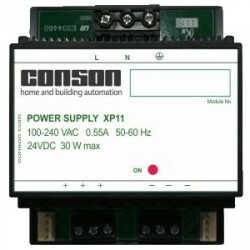 XP11 is a 24V DC stabilized and short circuit protected power supply. 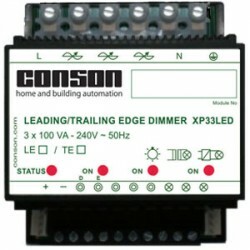 XP33LED is a 3-channel dimmer for dimming different types of LED lamps. 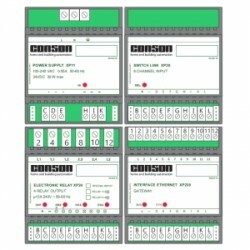 Each output can be configured as one leading-edge (LE) dimmer or as one trailingedge (TE) dimmer. In both modes, it can have resistive loads as well capacitive loads. The 3 outputs are overload protected. 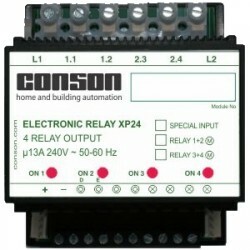 The universal relay module XP24 is a programmable relay module with four outputs (2x2) and two common 13A inputs.